Test Your Gullibility, installment #4732! Why, readers? Why do you do this to me? Whenever some new stupid fuel-saving thing comes along, you all insist on e-mailing me about it, as if you think I enjoy this stuff or something. 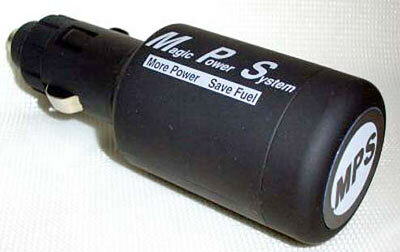 One of the people who told me about this "Magic Power System Power Shift Bar" mentioned that it could be an automotive example of Poe's Law, which states that no matter how outrageous your parody of religious fundamentalism, someone will still mistake it for the real thing. This compact Power Shift Bar is an Intelligent Electric Tune-up Device, which will dramatically improve the power & reduce fuel consumption of your car. Just plug it into the lighter socket of your car and drive. It is used for any vehicles operated on 12V batteries. Yep, that's right - this 35-quid gadget is supposed to clean your car, as well as give you more power from less fuel. I presume the next version will wax your car as well. All this from a device which, I remind you, just plugs into the cigarette-lighter socket! The eBay seller has a tidal wave of other car-tat on offer, but the rest of it isn't woo-woo - it's things like keychains, extra-wide rear-vision mirrors and tissue boxes with manufacturers' logos on them. I had to add a lot of minuses to my search to find just the Power Bars, but they do seem to be the only really nutty thing on offer there. I also, however, found the Power Bar on sale here, along with a selection of other extremely plausible devices. Oh, and there's also something called the "AIR CHARGER Pro", which has a dial on it and apparently uses "NANO TECHNOLOGY" and is "MULTI ADJUSTABLE". I think it's one of those electric supercharger doodads, but it's kind of hard to tell. I'm quite intrigued by what they've actually put in there. It's got to have something other than air so the customer doesn't feel ripped off. I wonder if it's just full of lead shot or if there's some useless electronics, like a big resistor. My 67 year old father once told me a story. An aunt of his was dying from cancer, and the family got together and pooled their resources (I believe it was in the 50s) and purchased this device that was supposed to cure her. It was a largish box on a metal stand that she plugged in at night to bathe her in "electromatic" waves while she slept. after she died... just a few weeks after recieving this device Dad managed to get some time alone with the "electromatic" and his tool set. the box was just filled with a maze of wiring, most just soldered to the casing. This dosen't rise to that level of charlatinism, but it comes close. Thank you Dan for dealing with all of this for us. Why do they do it? But Dan, obviously you love these things. Admit it. You have a collection of them. You probably have every single one of them installed on your car. Not only do you get great gas mileage, I bet gas actually pours OUT of your tank! The faster you go, the more gasoline you produce. @evilspoons - it's full of belief, if you open it the belief escapes. @Ziggyinc - at least it didn't electrocute her, it sounds like it wouldn't have been electrically safe. Stealing from people with cancer is pretty hard to top, people like that should be stoned to death after having their balls slammed in a drawer. I bet it attempts to charge the car's body up to a high potential. I agree that this had to have been a dare/bet. Can I be the next scammer? I've got a super-special keychain that digitally enhances the electromagnetic pulses passing through the ignition, smoothing out the voltage going to the spark plugs for more complete combustion! It'll make me millions! "Why, readers? Why do you do this to me? Whenever some new stupid fuel-saving thing comes along, you all insist on e-mailing me about it, as if you think I enjoy this stuff or something." It's no longer in the ebay store, by the way. Ahh, Jalopnik. You never get old, do you? isn't that an infinite improbability drive? « Yes, a battle-axe WILL do nicely!